In previous years, this was a memory box so we didn't miss any good nominations for the Cappies. With the Cappies hypertimed away, that doesn't mean we have to discontinue these threads. I've always liked going back at the end of the year and seeing the books and stories and moments that people really champion -- including plenty of stuff that I've forgotten about come Christmastime. So have at it, Legionnaires! It's a bold new year! What in 2017 has knocked you out? PRISONER KIRBY & KANE ARTIST EDITION: I bought this yesterday and, Richard, it is all you said it was and all I expected it to be. THE SILVER AGE FLASH OMNIBUS V3: This reprints issues #164-199. CORTO MALTESE TANGO: While I’m here I thought I’d also mention that latest Hogo Pratt collection. Today I bought PATRIOTIC HEROES from YOE Books. I can hardly wait to read this one. It was solicited for May 23, but anything edited by Craig Yoe is worth the wait. STAR HAWKS: The third and final volume of Ron Goulart and Gil Kane’s unique comic strip shipped today. DARK SHADOWS NEWSPAPER STRIPS: This collection is so far behind schedule that I don’t even remember when it was originally solicited. JACK KIRBY HEROES & MONSTERS ARTIST’S EDITION: ‘Nuff said. Oh, I can't wait to get this one and dig into it! This was an awesome run on Batman. Agreed, I thought Kelley Jones was a perfect Batman artist. I loved his work, and I was surprised when an artist as amazing as him agreed to do it at that time. The thing is, as good as his art is, I wouldn't want all Batman art to look like that. I was glad we had...I believe Graham Nolan on Detective at the time? 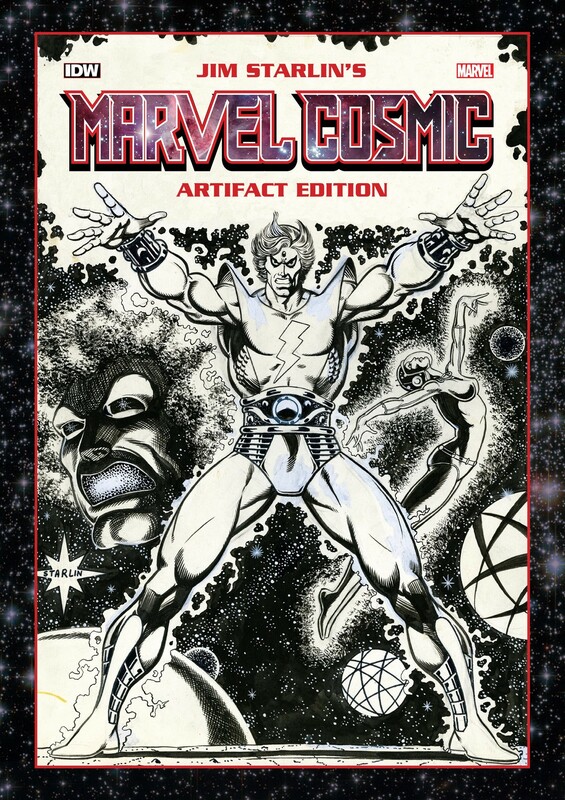 Close on the heels of Kirby & Kane's The Prisoner Artist Edition and Jack Kirby's Marvel Heroes and Monsters Artist Edition comes Jim Starlin's Marvel Cosmic Artifact Edition. I was just sent a review copy of the hardcover for Jason Lutes's Berlin. Its a series I lost touch with ages ago, since it was published so sporadically since the 1990s, but it's finally complete. And judging by the first 8-10 issues that I'd read once upon a time, I know it's going to be magnificent. I don't remember much of the details, but I remember it's a slice of life story following a number of different people in Berlin in the 1930s, as fascism crept in and then announced itself. Should be an interesting read today. This thing is frikkin' amazing! And it's HUGE! And it's only fifty bucks. It reprints Fantastic Four #48-50, #74-77, #120-123 and #242-244. I might have included the origin story from Thor in lieu OF #74-77, but that's a minor quibble. PLANET OF THE APES ARCHIVE v4: This volume completes the comprehensive reprinting of Marvel’s b&w POTA magazine. Lots of essays in this one. CARL BARKS LIBRARY v12: This had been a series I stayed current reading, but this makes the third volume on my “to read” stack. When I returned to collecting comic books after a hiatus of a few years, I collected in three directions: from the beginning forward, and from the present both forward and back. Consequently, there are a few titles (Daredevil, Iron Man and Thor for example) with “chunks” missing from the middle. For example, MMW Fantastic Four v20 (which shipped yesterday) collects issues #219-231 and Annual #15, most of which I have never read before, including the entire Moench/Seinkeiewicz run. I have read the John Byrne two-part fill-in and George Perez annual collected elsewhere, but now, with this release, my Fantastic Four collection is at last complete.